In 1824 this building would have stood alone surrounded by open farmland. In 1978, and following a vigorous campaign by the Queens Park community, the shell of the building was saved and the Spa Nursery built to a design by East Sussex County Architect, Tim Williams whose vision was that the colonnade would be used for community events such as open air theatre. Charles Barry's scheme for Queens Park, 1834. Reproduced by kind permission of Howlett-Clarke, solicitors, Brighton. 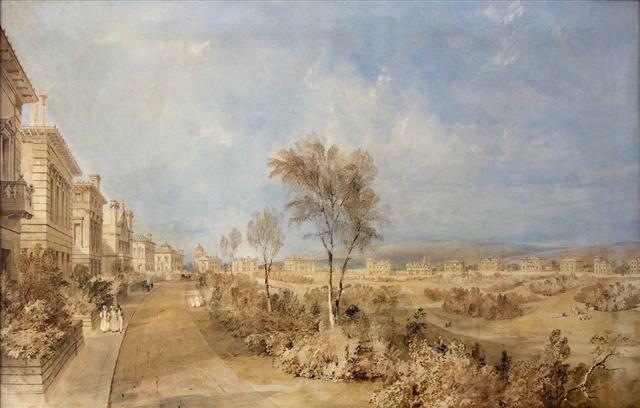 Ten years later this watercolour was comissioned by Charles Barry to show off the eccentric variety of possible architectural styles designed to tempt the well heeled followers of the Prince Regent now esconsced in his new palace on the steine. Sadly only three villas were built of which only Queens Park Villa (centre left) remains. Security for the site was provided by a high flint and brick wall, most of which still stands today. Gates (2 of 3 remain) and gatehouses (demolished) were to police the comings and goings. Easy access to Brighton by the new railway caused the Prince Regent to abandon Brighton for more secluded premises in London. The aristocracy followed, the big dream collapsed and it would be seventy years before the fine Edwardian houses we see today were to occupy the vacant sites.